Today is Earth Day. Forgive me if I don’t feel like celebrating. I might sound a little snarky, but I find too much of the current Earth Day celebrating to be nothing but a bunch of marketing hype, Earth Day-branded discounts, and various corporate greenwashing tactics – all aimed at wasteful consumerism. “Go GREEN – buy this (useless-crap-you-don’t-need-that-will-end-up-in-the-landfill) and enter EARTH at checkout to receive your 15% Earth Day discount!” Throw in a few token speeches, a ceremonial planting of a tree, an elementary school poster contest, and you’ve got Earth Day 2010. 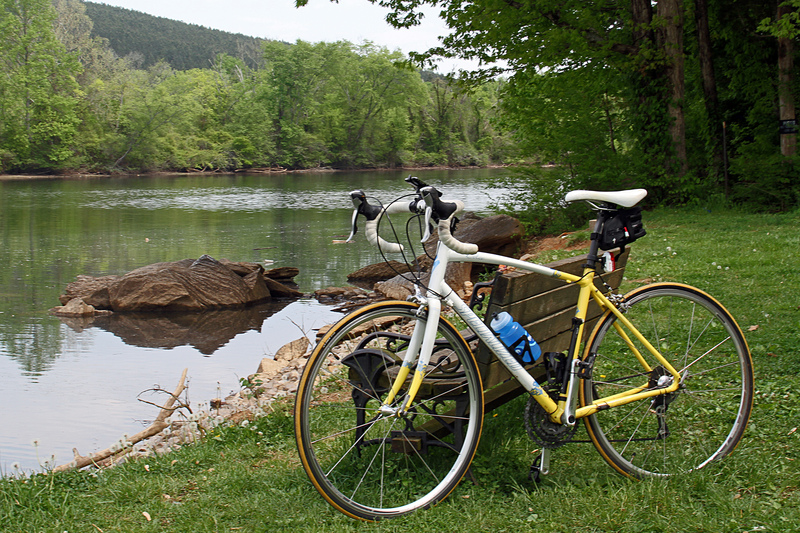 Today’s ride was to points along “our river” – the Hiwassee River that runs near our house. 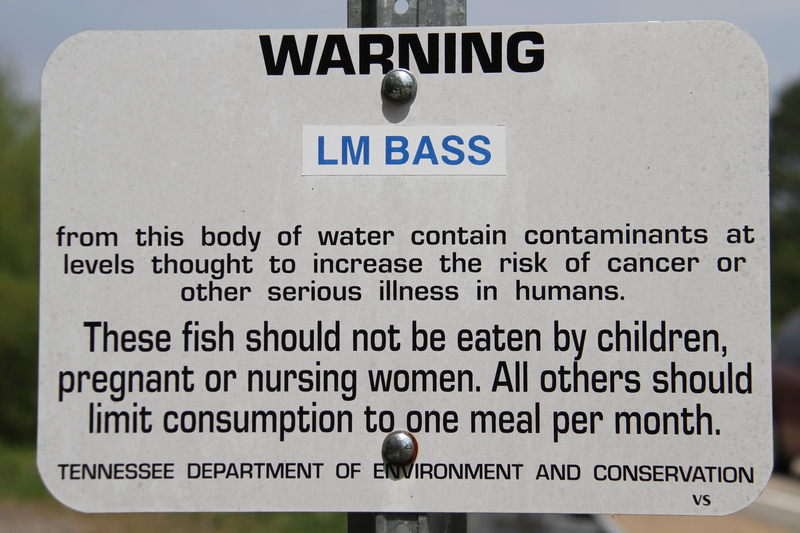 The river that now, thanks to the wonderful folks at Olin Chlor-Alkali corporation, is so contaminated with their mercury discharge that the few remaining fish that survive outside of the “dead zones”, namely bass, have been found to contain mercury levels 25% above EPA limits. The last documented EPA Toxics Release Inventory (TRI) indicated mercury discharge rates in tons – both airborne and “discharge to receiving streams and/or water bodies”. 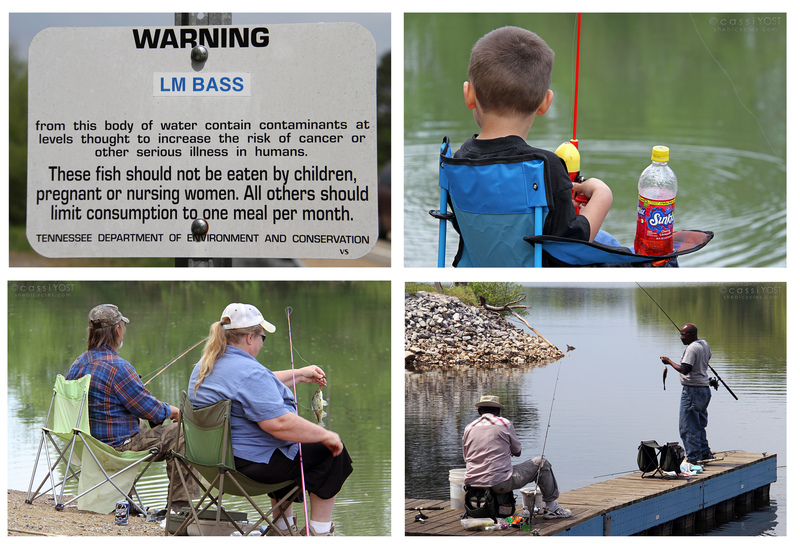 The warning signs are posted at nearly every put-in and boat dock, yet I am continually stunned to see people fishing here – and keeping their catch. Today was no exception. 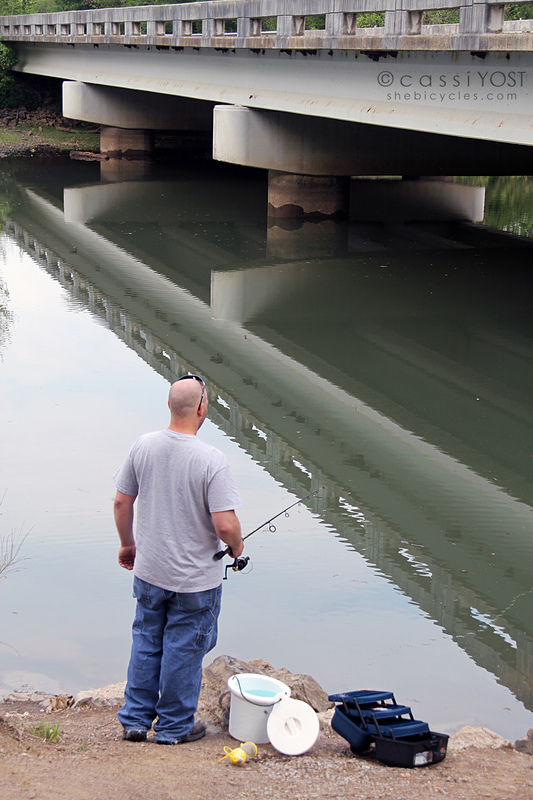 I stopped again near the boat ramp/marina – a location closer to the Olin plant and their discharge sites. I’d been on the water just upstream from here near the plant (by boat) and you can visually see – in the water – a line of demarcation where there are “dead zones” from the pollutants. 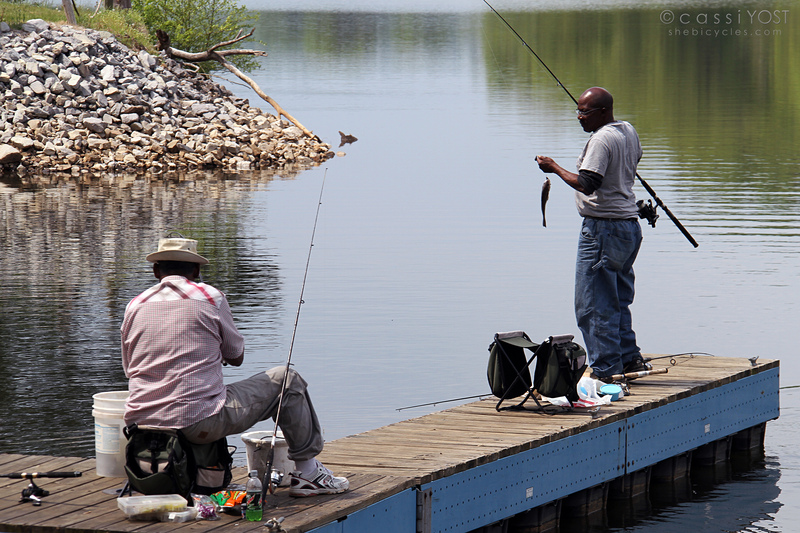 Two gentlemen were out on the small dock fishing. And catching a few bass. I stopped and talked to them too. They told me they kept what they caught, as well – “They’s some good eatin’!” When I asked if they were concerned at all about the mercury discharge from Olin, one of them told me that he knew someone who worked there, and he knew it was “real bad” – but figured if the fish were out swimming, they were probably ok. In both cases, I just didn’t know what to say? “Are you out of your minds? 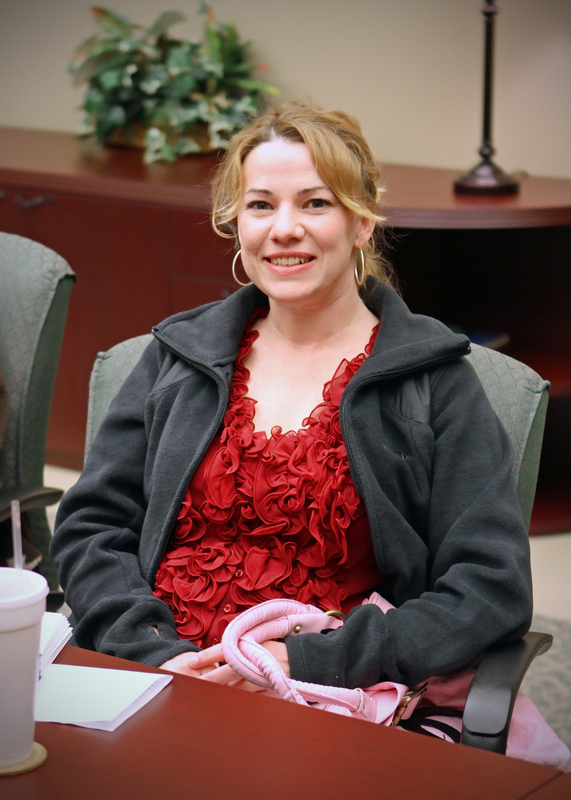 !” I couldn’t say anything, but just thanked them for letting me photograph. On my way back was probably the most disturbing encounter I had today. 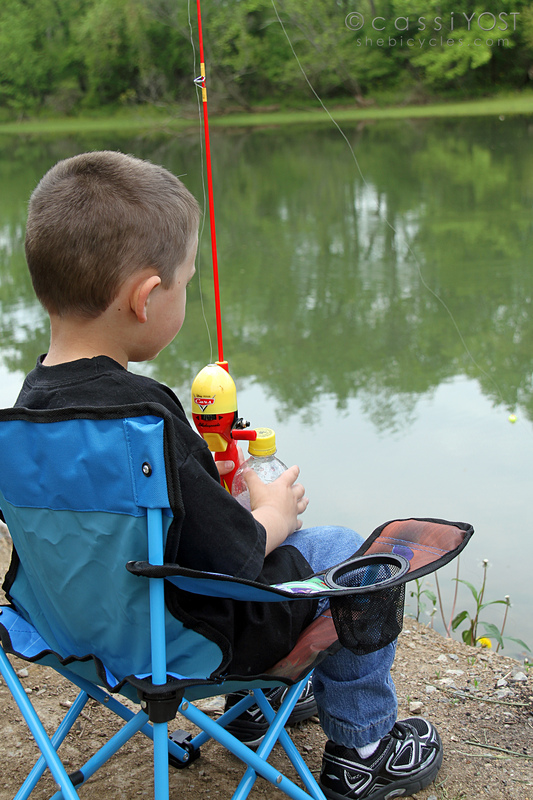 It’s were I spotted the little boy, Brady (5 yrs old), out fishing with his dad near the bridge. Again, I stopped, talked to them and asked if they would mind if I took a few pictures. Sure, no problem. This time, I only asked if they kept their catch. They said yes. It honestly nearly broke my heart. How could they ignore the warnings? With no concern for possible cancer, reproductive, or brain development issues that can be caused by mercury consumption? I had to leave. Olin is on record, and has known of the impending need to convert their plant to mercury-free technology – yet has repeated chosen to ignore their responsibility, and they are now crying foul. With the threat of pending legislation which would require them to convert their plant within 2 years, they are now attempting everything possible to stop passage of the bill. And they are being facilitated by indulgent (and well-lobbied) politicians – namely Senator Bob Corker (R) and Representative Zach Wamp (R). Olin has successfully converted other plants – including McIntosh, AL, Niagra Falls, NY, and St. Gabriel, LA – and yet continue their exuse-making when it comes to the Charleston, TN, plant. Because they have been allowed to get away with it. 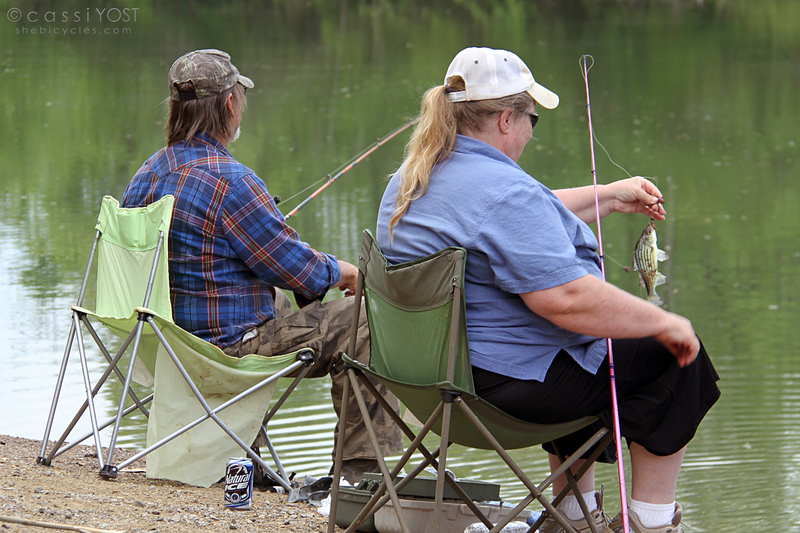 Because they know the political will to protect the health and well-being of the river and local citizenry doesn’t exist – it is the hallmark of every environmental disaster brought about by abusive corporations and the political power they purchase. Coupled with the recent decision by the US Supreme Court to overturn restrictions on corporate spending in elections, it can only get worse. Olin bases their refusal to convert the Charleston plant on expense and jobs “lost” – which they know is complete fiction. Over 100 other plants have demonstrated that the conversion to mercury-free technology can be completed within 18-24 months, with minimal production downtime. The converted plants not only provide safer working environments for their employees and surrounding residents/neighborhoods, but also save energy and increase production capacity. A similar conversion by PPG provided jobs for over 250 additional workers. Olin, your excuses just don’t fly! Olin continues to claim that conversion of the plant is “economically unfeasible” … So can they please explain to me how they can justify their recent disclosure of obscene executive pay increases? Joseph Rupp, Chairman/President/CEO of Olin Corp. received 14% pay raise, awarding him annual salary of 5.7 million dollars. John McIntosh, President of the Chlor Alkalai received 12% pay raise, bringing his annual salary to $1.4 million. Please explain to me how a plant conversion is “economically unfeasible” when contrasted with your executive compensation? So, it’s Earth Day. And Walter Cronkite was quite the visionary. The problems remain. The Mercury Pollution Reduction Act appears to be stalled in the federal bureaucratic black hole. The mercury dumping continues. 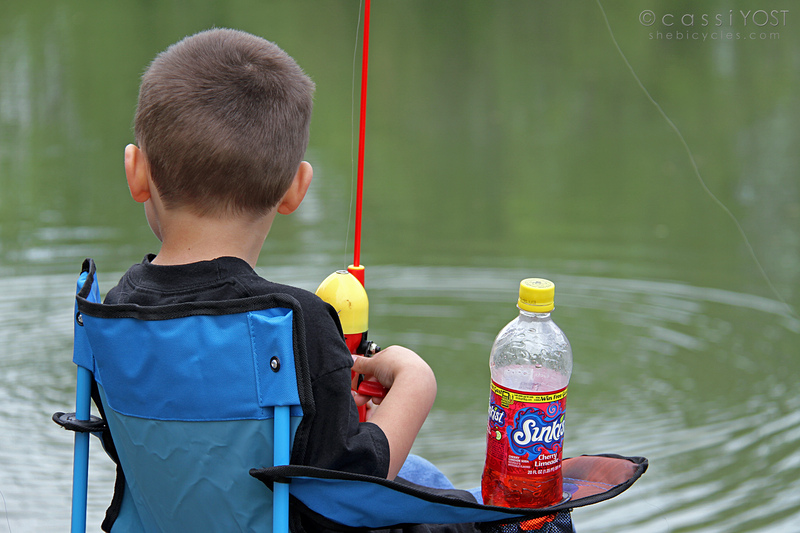 A little boy is eating toxic fish. The problems remain.